I'm cutting it a bit close here with this Independence Day mani, huh? I'm going to be cutting it even CLOSER when I try to do some nail art today to have ready to post tomorrow! Let's look at today's nails! Glitter everywhere! Let's look at the red nails first. For the base, I used OPI The Color of Minnie. The glitter on top is Daring Digits Blueberry Square. I copied the idea of putting this glitter over red from Carly at Lacquered Lover after I saw her post it on Instagram! It was such a great use of this glitter that I couldn't resist. The blue nails start with a base of butter LONDON Blagger. The white glitter on top is All That Glitters Spotty Dottie Light. Of course, you know I had to go for my favorite accent nail combo -- pointer and middle finger. You can find Daring Digits and All That Glitters on Etsy. At the time of posting, Spotty Dottie Light is in stock, and Blueberry Square isn't, but a related polish called Cherry Square (with red squares instead of blue) is. Don't know why not just wear this mani for the 4th of July! I love when manis are only INSPIRED by things, rather than have the purpose written all over them. This one's gorgeous, I'd feel bad removing it. But I'm sure you'll come up with something even better! Can't wait for tomorrow's post! Pretty, a nice change from the usual stars and stripes designs! Nice pairings, and great take on the theme. Very fresh! I love this layering! It's so gorgeous. You're right! Brain fart. Thanks! Updated my post! this is very simple yet extremely cute. i find it quite effective for july 4th! 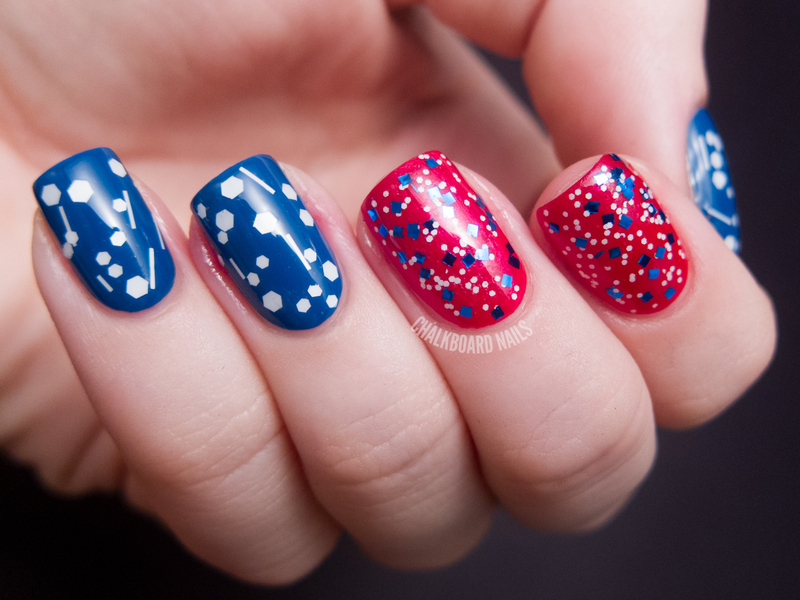 this is a perfect 4th of july mani! Truly stunning glitters and perfect for the 4th! So pretty! I love those glitters! Sarah, great job as always - "simple" but perfectly adorable for the holiday!